Fantasy Zone II: The Tears of Opa-Opa (ファンタジーゾーンII オパオパの涙, Fantajī Zōn tsū: Opa-Opa no Namida?) is a Sega Master System game developed by Sega and published in Japan in 1987. It was later ported to the arcade, Famicom, and MSX. Like the first Fantasy Zone, the player controls a sentient spaceship named Opa-opa who fights surreal invader enemies. Like its predecessor, Fantasy Zone II departs from the traditional scrolling shooter themes with its bright colors and whimsical designs. For this reason, it is occasionally dubbed a "cute 'em up". Similar to Defender, the player occupies a side-scrolling level that repeats indefinitely, and in which the player can freely travel left or right. Each zone contains several "bases" that serve as primary targets. New to the sequel are "warps" hidden behind certain bases that allow the player to travel between different zones. Each level has at least three zones, and when all of the bases have been cleared in all of the zones of a level, the player can travel through the warp to the boss. 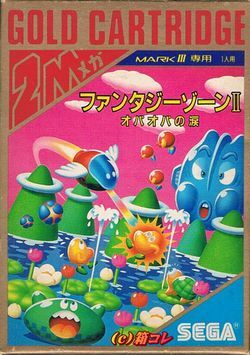 The arcade version of Fantasy Zone II is based on the System E board, and as a result, is almost identical to the Master System version. Differences include the use of the radar that shows which bases are destroyed or not, as well as the use of a timer that, when it reaches zero, the player will lose a life. If the player manages to clear a level, the timer's remaining seconds will add to the score and money. In September 2008, Sega released a remake of Fantasy Zone II, included on the compilation Sega Ages Vol. 33 Fantasy Zone Complete Collection. Developed by M2, the game is not an attempt to modernize an older work like most remakes, but rather a hypothetical interpretation of what the game might have been like, had it been developed for System 16 arcade hardware by the original staff, rather than by Sega's console R&D for the Sega Master System and System E boards. It has been described as a "What If" remake, and strictly adheres to the technical limitations of the time in which Fantasy Zone II was originally released. Fans of this version refer to it as Fantasy Zone II DX. A Nintendo 3DS port of this 16-bit version was released in Japan in 2014 and internationally in 2015. Titled 3D Fantasy Zone II Double, it includes new features, content, and a second game mode called Link Loop Land, an endless survival mode starring Opa-Opa's brother, Upa-Upa. This page was last edited on 26 February 2016, at 02:30.